we love watching "top design." not just because we get a lot of great home-improvement ideas on the show (pero kainez they make it look soooo easy!! 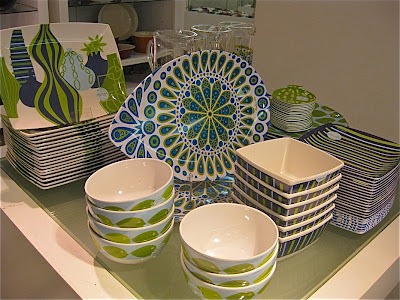 ), it has two of our favorite designers, todd oldham and jonathan adler. we love both designers' design aesthetic—they both love color and prints, their designs have a cool retro vibe, and we like the biomorphic shapes they often use. plus they're both so darn cute! while we miss todd's foray into fashion, jonathan has been expanding his empire. from pots and vases, he now has a complete home line that includes furniture and home accessories. 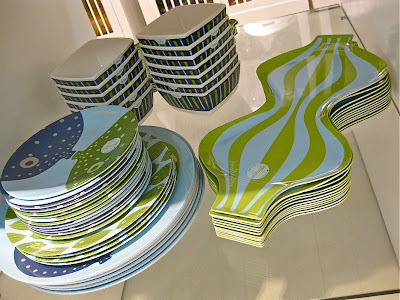 so we were delighted to see that rustan's makati's home section carries his dinnerware line! 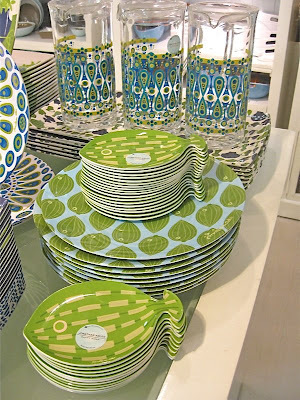 this is the happy home collection of outdoor-dining melamine plates, trays, bowls, and pitchers with 50s-inspired patterns. weelavett!! Just off-topic, I happened to get hold of this H&M Magazine for Spring 2009. Bryanboy was named as the Hottest Styleblogger! He is "the first styleblogger to have a Marc Jacobs bag named after him..."
Now, peeps (or crabs) can say anything they want to say about Bryanboy. He has not achieved world class attention for nuthin. No comment on the wacky Kelly Wearstler? And even wackier (or maybe wacko) fashion style? Haha! I love finding out what her look will be each week!